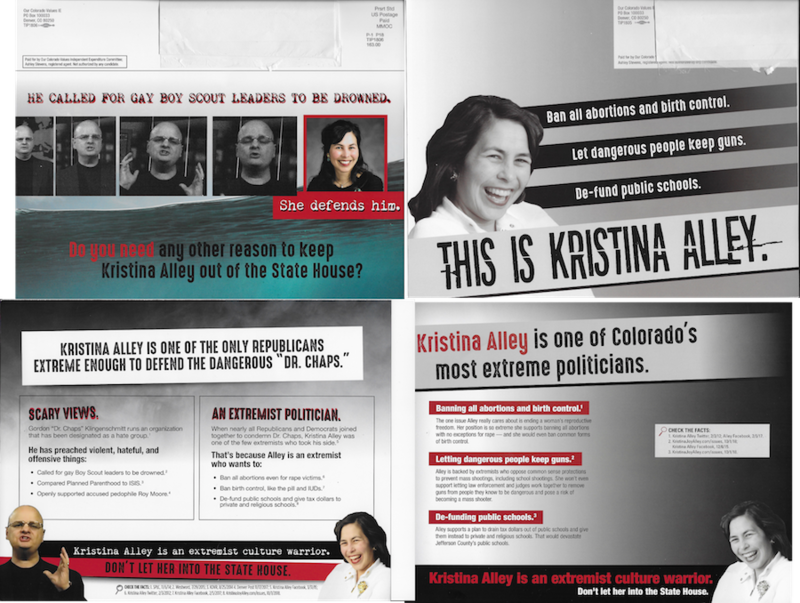 This mailer from Democratic super PAC Our Colorado Values goes after Republican House candidate Kristina Alley, linking her to former Colorado Springs Rep. Gordon Klingenschmitt. He is a controversial evangelical and former Army chaplain who was convicted in a court martial for appearing at a media event after being ordered not to. The mailer says that Alley agrees with Klingenschmitt about banning abortion and some forms of birth control, that she opposes laws to allow law enforcement to take guns away from people they think are dangerous, and that she wants to give public school money to private schools. She faces Democrat Kerry Tipper in the open Jefferson County seat. Our Colorado Values is a state super PAC supporting Democratic candidates for state House in Colorado. Large donors include The Sixteen Thirty Fund at $400,000;Education Reform Now Advocacy at $350,000; $300,000 from Everytown for Gun Safety; $200,000 from union SEIU COPE; Environment America at $87,500; Colorado Fund for Children and Education at $77,500; and PhrMA and the Democratic Legislative Campaign Committee at $50,000 each.